Since you all enjoyed our wedding cake so much yesterday, I needed to share one more thing with you. We had a separate cookie room. More like a dessert room. I’ve heard rumblings that cookie tables/rooms only happen in Pittsburgh and Western Pennsylvania. What do you think? Have you ever been to a wedding with a cake and cookies? Here is Mother Lovett, sneaking into the cookie room before it was open to guests. She always needed to know what was going on. She also probably wanted to finger and inspect every single cookie in the room before putting it back on the tray. We had cookies for days. For weeks. For years. For eons. In fact, my mom still probably has some in her freezer that she will deem appropriate to serve at Christmas. Would you like a side of freezer burn with your cookie? Uh oh. Mother Lovett is back. This time she has a different guest accompanying her. She must have missed a few cookies to touch. Don’t worry, I’m pretty sure this is before our good friend Barb spent 90 minutes in the restroom helping her with her girdle. Parmesan Ranch Crispy Chicken Fingers. I had a dessert room that had cookies and coffee at my wedding! And it was in Rochester, NY. Maybe it’s a northeastern thing? Yours looked much more full of cookies, though ;) Now I have to find my proofs to see what mine looked like! It’s been 11 years :) Beautiful wedding!!! haha Mother Lovett is my kind of lady!! She’s just doing her part in making sure that all the cookies up to par for your guests to enjoy. What a sweet self-sacrificing lady! We don’t exactly have sweet rooms here in Toronto, but at the Italian weddings they usually set out some sweet tables in the foyer alongside the cake. 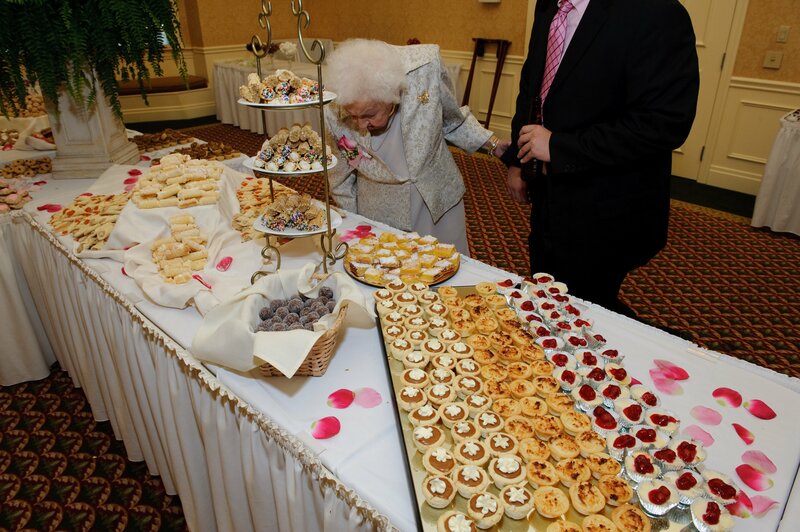 But at the bridal shower, the main event is the cookie tables that line the hall room. The bride actually puts our plastic take-home containers and once the event is over all the nonni go crazy fighting and filling up as many of those suckers as they can to take home with them. A cookie room?!? What a fantastic idea!!! I think the cookie table thing is a Pittsburgh thing too. My husband is from PGH and all of the weddings we go to out there have them. I’m from CT so I had never heard of it. But I loved it! At our wedding we set up a cookie table and we had family make their best cookies for it. I set it up almost as a favor and put cellophane bags and a custom made stickers on the table so people could make their own to-go bags of cookies. I also put a framed note on the table explaining the cookie table tradition to all of my out of town guests. A cookie room? That’s going to be a permanent fixture once I get my own home! That is brilliant! My brother and his fiance are getting married in December and they are having a dessert buffet at their wedding… “Taste of Lancaster” desserts is I think what the catering company called it – lots of PA Dutch stuff like whoopie pies, shoofly pie, etc. Maybe it’s a PA thing? Can I get a cookie? Please? From your secret stash? Eastern PA, specifically northeastern PA, does cookie tables. I was a banquet server for a few years and worked a lot of weddings. Many of them had what we called Viennese Tables – cookies, pastries, mini desserts, etc. The table was set up after the cake was cut and served towards the end of the night. I thought it was a great way to end the wedding. And yes, we had one at our wedding 6 years ago. As far as I know it’s usually an Italian tradition to have a cookie table, at least that’s how it is in my and my fiance’s Italian families! But we’re also from Ohio, so maybe it’s an Ohio/Pennsylvania thing? yes, i’m from ohio too (and also italian) and i have never been to a wedding without a cookie table!